It’s not summer until you’re shoveling berries into your mouth at every opportunity. It’s just not. For a few glorious, balmy months each year, chocolate and decadence take a back seat and berries give dessert a healthy makeover. My ideal summer dessert is light. It doesn’t make me want to take a nap, it doesn’t force me to work it off later, and it doesn’t require a lot of time for prep or cleanup. My ideal summer dessert looks a lot like this. Berries are everywhere right now. They’re in party platters, they’re on display at the farmer’s market, and they’re in pies. 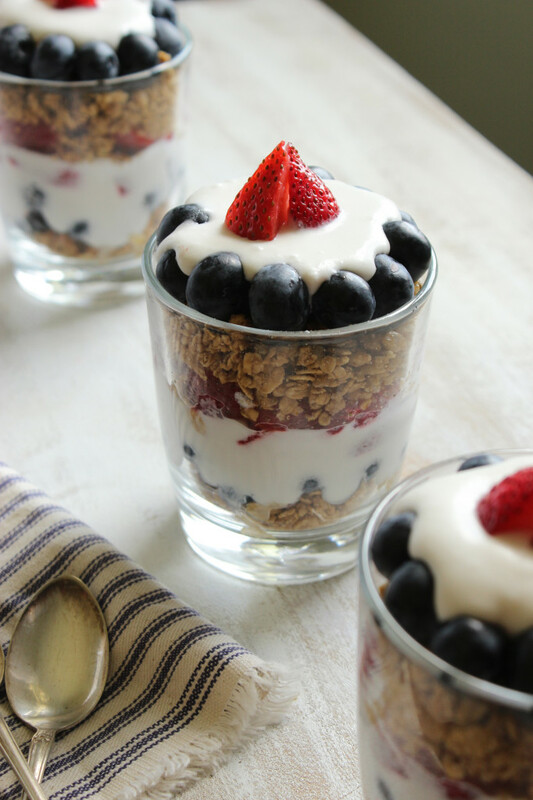 They’re for breakfast, they’re for snacks, and most definitely, they’re for parfaits. 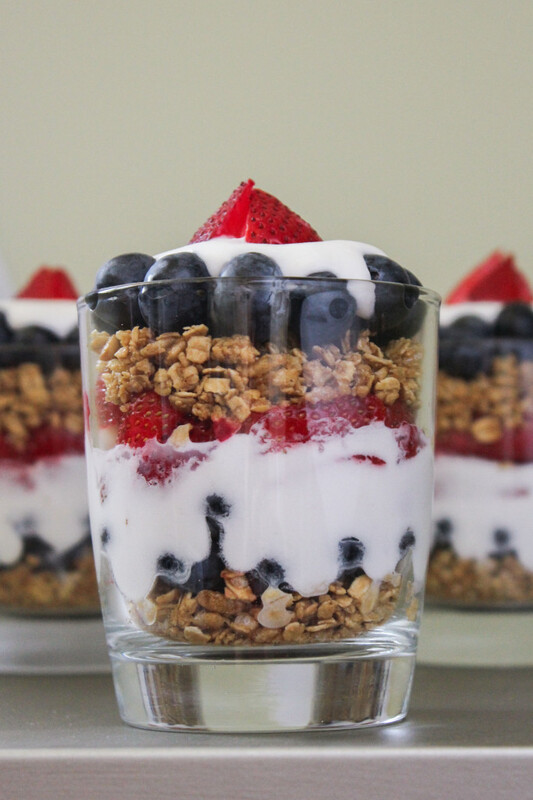 These parfaits don’t need yogurt because they’re got plenty of other things going for them. If you play your cards right, you can achieve crunchy, tart, juicy, and creamy all in one spoonful of this dessert. You know the way sparklers light up the smoky night after all of the fireworks have been fired off? 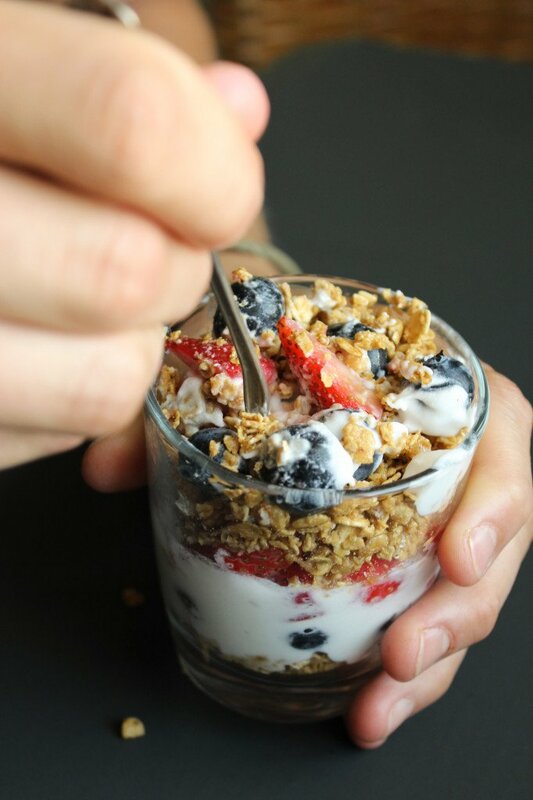 That’s the way this parfait makes your mouth feel. 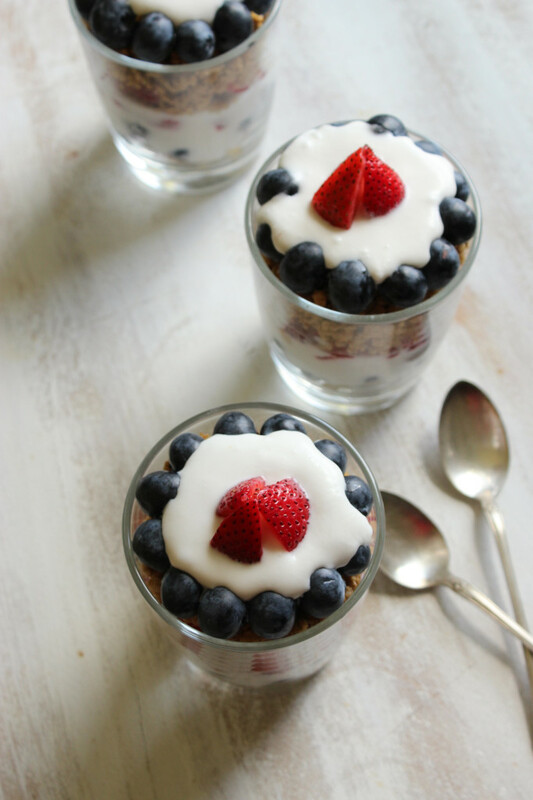 It’s a Fourth of July party in dessert form. As pretty as this parfait looks when it’s sitting on the table – waiting to be picked up and devoured – it looks and tastes even better with every bite. When your spoon digs into the first layer, everything starts mixing together. Red, white, blue, gold. Summer. When it comes to this dessert, quality counts. For juicy bites, select the reddest, lushest strawberries. Only the plumpest blueberries will do. Crunchy, honey-flavored granola works best. And fresh whipped cream is a must – while I prefer coconut whipped cream, you could certainly substitute fresh dairy whipped cream or Greek yogurt. I didn’t have a slew of trifle cups laying around, so I chose these low-profile cocktail glasses. In my opinion, it works. It gives the desserts an “Oh, this old glass? I’m only served in this when I don’t care how I look” quality. Layer it however you like. Serve it however you like. Eat it however you like. Just make sure you enjoy it with a healthy appreciation for summer and all it has to offer. The best summer has to offer – in dessert form. 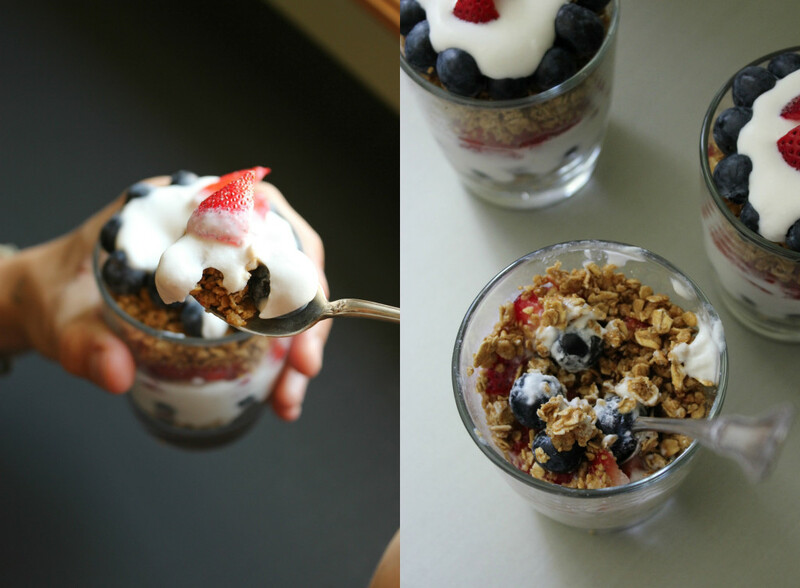 Juicy, ripe berries meet coconut cream and crunchy granola for a healthy treat. Chill canned coconut milk for at least 24 hours prior to making the recipe. Be careful not to shake or disturb the can – doing so will make it harder to create fluffy whipped cream later! 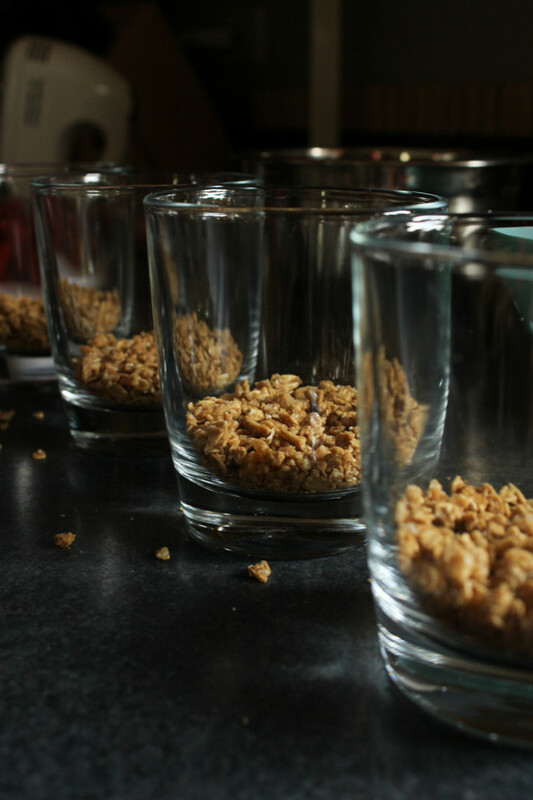 Add 2 cups of granola cereal to a bowl and crush using a measuring cup, your hands, or something creative. For this recipe, we used Cascadian Farms Oats & Honey Granola Cereal. Hull strawberries and cut into 1/2″ chunks. Set out a large bowl. Open the can of coconut milk and carefully spoon the solidified portion into the bowl. Add powdered sugar. Using a hand mixer on high, whip the the coconut cream, sugar, and vanilla until well combined. It should start to get fluffy after a minute or two. 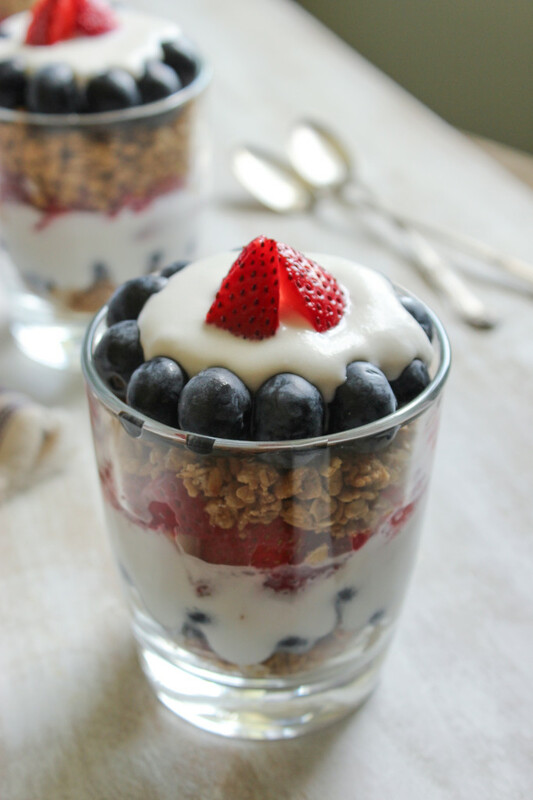 Refrigerate it until you’re ready to layer the parfaits. 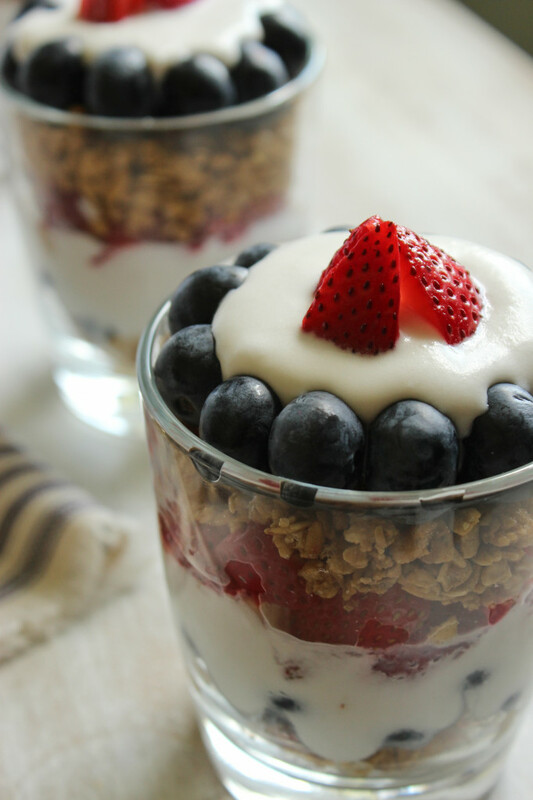 It’s time to start layering your parfaits! 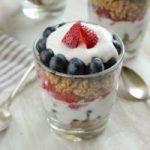 Start with about 1/2″ of crushed granola, then add a layer of blueberries, then whipped cream, then strawberries, then granola, then blueberries, then cream again. Top with your choicest berries for a striking garnish! i have to try coconut milk. this looks great!